Jane Alpern’s classes are held in her Dresher studio, a friendly and encouraging environment. Jane focuses on the positive and makes learning fun. Projects are age appropriate, and each piece is as unique as the individual who created it. Students explore a variety of materials and techniques, and often view examples from art history for inspiration. Because art involves learning to see, drawing instruction is an integral part of the curriculum. As we discuss the art elements of shape, line, color, and texture, students develop an art vocabulary as well as skills. They are encouraged to explore options and problem solve. Each session brings new projects, and many students take our classes year after year. Sessions usually begin with a clay project, allowing time for glazing and firing. Kids love clay, and there is no better material for tactile expression! 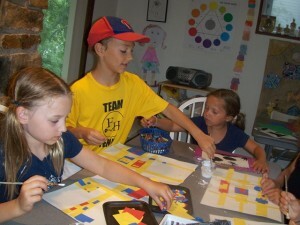 We also include lessons in drawing, painting, and printmaking. Quality materials are always used. Why should the kids have all the fun? Come for a relaxing escape from your day-to-day routines. Explore and create while you enjoy the company of other adults. In addition to scheduled classes, we offer Create a Class for adults. Simply gather 4 or more friends, decide what you would like to explore, and we will run the class. Jane Alpern has a BFA in Fine Arts and a M.Ed. in Art Education. 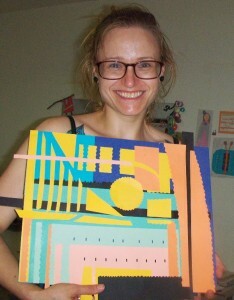 She has over ten years of experience teaching art to students of all ages. She was the Upper School art teacher at Newtown Friends School for nine years. In addition to teaching in her Upper Dublin studio, Jane also teaches after school art at Good Shepherd Catholic Regional in Glenside. She teaches Judaic Arts at Congregations Beth Sholom and Aduth Jeshurun, both in Elkins Park. An accomplished artist, Jane has exhibited her work and received commissions for both her pottery and handmade books. Combining stitching with hand printed papers is an example of the mixed media pieces she is currently creating. 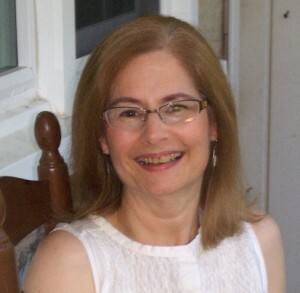 Jane also enjoys spending time with family and friends, cooking, gardening, and reading. Jane’s background as a potter introduced her to ceramics made all over the world from thousands of years ago to the present. She believes that creating is uniquely human, that art is for everyone who enjoys making it.